Imagine stopping your buzzbait right next to that stump and letting it float there, then twitching and shaking it to entice a big bass to strike. Or, how about retrieving your buzzbait with slow twitches and subtle movements when fish are especially finicky? Or, throwing a buzzbait on top of the slop or over wood cover and working it out with no snags? From the company that brought anglers the Jitterbug and the Hula Popper, two legendary topwater lures, comes the totally unique Buzz Plug, a near weedless floating buzzbait with built-in action. 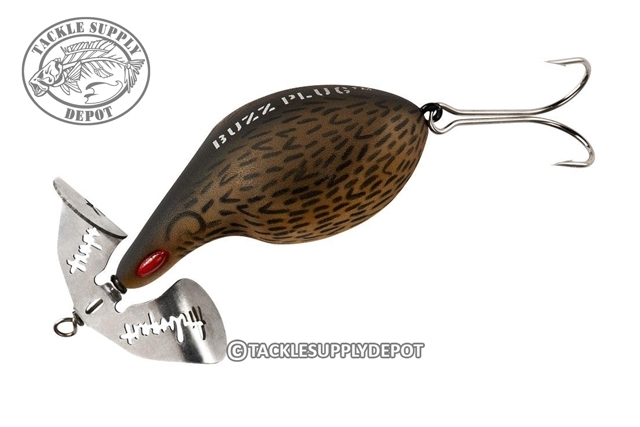 With a normal constant buzzbait retrieve, the Buzz Plug waggles side-to-side in a swimming motion, and when paused, the nose and blade lifts out of the water and perfectly positions the upturned double hook for sure hooksets. This same front-end rise allows the angler to slap the water by twitching the rod tip. The double upturned hook is nearly weedless, allowing anglers to throw it onto sloppy weedbeds or into heavy cover and bring it back without snagging.